It may well have been the most ambitious single Franklin search of all time, and -- although its results were modest -- we now know it came agonizingly close to discovering the wreck of HMS "Erebus." It was officially known as "Project Franklin," and much of what we know of it today is thanks to the accounts written by William C. Wonders, a leading geographer of his day and project participant. What follows is largely based on his article, "Search for Franklin," which appeared in the Canadian Geographical Journal (now Canadian Geographic) in 1968. The search had its origins in the Franklin fascination of yet another passionate amateur, Mr. W.G. McKenzie. McKenzie, an insurance agent then working in London, Ontario, he had a particular conviction that Franklin's grave, which he believed must have been a substantial one, ought to be able to be relocated, given sufficient manpower. McKenzie write to the Minister of National Defence (Paul Hellyer, who is still living as of this writing), with what turned out to be a very convincing proposal. The original plan called for just eight searchers, drawn perhaps from the Naval Training Division, but it grew in the planning to be a substantial land, sea, and air exercise. Part of this was due to 1967 being Canada's centennial year, but the friendly rivalry between various departments and branches of service also played a role, Ironically, as Wonders noted, "what was originally conceived as a naval expedition became essentially a Canadian Army operation, with support from the R.C.A.F., but without one member of the Navy being directly involved." The search was planned to focus on the former site of the North Magnetic Pole (on the theory that Franklin's grave might be nearby), the vicinity of Cape Felix (for the same reason), and eastern Victoria Island, on the thought that men from Franklin's ships might have reached there. In the later stages of planning, a five-man diving team was added, to be deployed in the vicinity of O'Reilly Island. Two CH-113A Voyageur helicopters were assigned for transport and support, and a base camp near the DEW-line station at Gladman Point was established early on August 5, 1967. A total of fifty-two men would ultimately participate in the search. Weather, as it always will in the north, delayed the deployment of some of the teams, and conditions on the ground limited some of their searches, but by the project's conclusion twenty days later, nearly all the target areas had been visited. The team at Cape Felix re-discovered notes left by Henry Larsen in 1949, along with a boot-heel and some Inuit artifacts; searches at Terror Bay, the Clarence Islands, the west coast of the Boothia Peninsula, Taylor Island, the RGS Islands, and the Adelaide Peninsula found no Franklin materials, though numerous Inuit tent-rings and artifacts were observed. It was, for the land searches, a disappointing result. The land search of the northern tip of O'Reilly Island, however, came up with a number of promising items -- copper sheeting, spice tins, a block and belaying pin, and an oar -- which testified to the possible presence of a wreck nearby. The divers, in Wonders's account, "discovered nothing" -- but as sometimes happens, that wasn't quite true. On a ridge on the island, one of the divers came upon a substantial piece of wood, which -- with the names of his mates carved into it -- he turned into an ashtray and retained as a souvenir! It was, without doubt, a piece of HMS Erebus, as the diver, Bob Shaw, later realized. 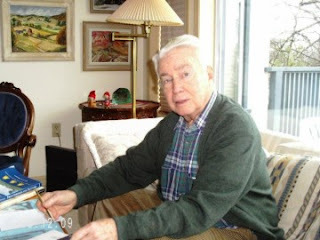 William C. Wonders was one of Canada's most eminent geographers in his day; he served a term as President of the Canadian Association of Geographers, and received both the Order of Canada and the Queen's Jubilee Medal. Sadly, he did not live to hear news of the discovery of Erebus; Dr. Wonders passed away on January 24th, 2011. You can read the full text of his article at the Canadian Geographic website. I knew Bill Wonders as a frequent visitor and buyer in my bookshop in Edmonton in the 1980s and early 1990s. He frequently sold me books as well (including travel books but also modern books on the arctic--he would accidentally acquire duplicates). Before he moved to Victoria, he donated his vast map collection to the University of Alberta. When I moved to Victoria I visited him in his home, and although I tried to purchase some of his better 19th century Arctic books when he called me in for one of his regular culls, I was never successful in tickling out the few rare Search for Franklin titles he had held on to for so many years; these and many other desirable books were donated to Vancouver Island University, an experience that was "painful" as I was called in to do the appraisal, and not to make a purchase. He had, as it happens, multiple copies of "Operation Franklin," which he sold me. The best value of the book, I thought, was in all of the maps that detailed the exploration of the arctic. The title is Fortier, Y.O., et al. GEOLOGY OF THE NORTH-CENTRAL PART OF THE ARCTIC ARCHIPELAGO, NORTHWEST TERRITORIES (OPERATION FRANKLIN). Ottawa: Dept. of Mines, 1963. 671pp. Thick 8vo. Many maps, tables, illus. Burgundy cloth. Bjarne, many thanks for this -- it's fascinating! In retrospect it must be one of those "what if" moments in one's life thinking how close they had come to the Erebus. The "Erebus ashtray" is a good story too! Interesting that Parks Canada brought up a belaying pin from the wreck last fall and one had already been on shore!